Staff Engineer in Panama City Beach, Jordin Findling, is at it again! 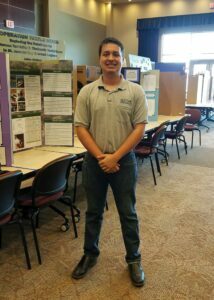 He recently volunteered at the Three Rivers Regional Science and Engineering Fair at FSU in Panama City. Around 150 young scientist from Bay, Holmes, and Gulf counties came together to showcase their hard work. Students researched anything from the behavior of butterflies to electricity.